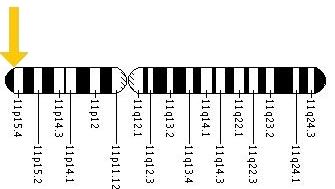 DRD4 (Dopamine Receptor D4) is a gene that encodes for a receptor, in this case, the receptor (subtype) D4. Dopamine receptors are responsible for neuronal signaling in mesolimbic system of the brain, which is an area that regulates emotions as well as behaviors. The gene DRD4 encodes for the D4 subtype. The D4 subtype (receptor) is a G protein, (a G protein helps transmit information from outside of the cell inside), inhibiting adenylyl cyclase (an enzyme regulating cellular signals). D4 receptors are part of the G protein receptor family, and this family also includes the receptors D1, D2, D3, and well as D5. There were more D4 receptors shown in the brains of patients with schizophrenia whereas a lower density of D4 receptors was shown in the brains of patients with Parkinson. Because of this, it is a target for a lot of drugs to treat patients with both schizophrenia and well as Parkinson disease. DRD4 is a gene that contains different DNA sequences for different people. These differences from person to person are called polymorphisms. In an experiment in 2006, researchers used paradigms to model how genotype moderates a subjects’ reaction to environmental stimuli associated with addictive substances. The experimental stimuli used were priming doses or drug cues; specifically measuring the craving of a lit cigarette between tobacco smokers with DRD4 short and DRD4 long. In conducting the experiment, researcher first investigated whether a function variable number of tandem repeats (VNTR) polymorphism in DRD4 affected craving after priming doses and drug cues. The participants were given three alcoholic beverages or three controlled substances (placebo effect). Individuals carrying the DRD4 Long (L) allele had a stronger urge to drink alcohol rather than the controlled substance. This experiment suggests that carriers of the DRD4 (L) allele are more susceptible to addiction, experience more craving, and arousal as oppose to carriers of the DRD4 (s) allele. 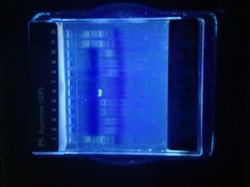 With our own DNA, we did PCR in order to isolate DRD4 with our left and right primers. Above are our left and right primers that we needed for the PCR experiment. Although it is hard to see through the picture DRD4 is located in the 10th column, and our PCR product size was supposed to be 724. "DRD4 Exon 3 48 bp VNTR." Colorado.edu. http://ibgwww.colorado.edu/genotyping_lab/pdf/dopamine_d4_receptor.pdf. Johns Hopkins University. "DOPAMINE RECEPTOR D4; DRD4." OMIM. http://omim.org/entry/126452?search=DRD4&highlight=drd4. National Center for Biotechnology Information. "Gene-environment interaction between dopamine receptor D4 7-repeat polymorphism and early maternal sensitivity predicts inattention trajectories across middle childhood." NCIB. http://www.ncbi.nlm.nih.gov/pubmed/23627945/. Weizmann Institute of Science. "Dopamine Receptor D4." Gene Cards. http://www.genecards.org/cgi-bin/carddisp.pl?gene=DRD4.